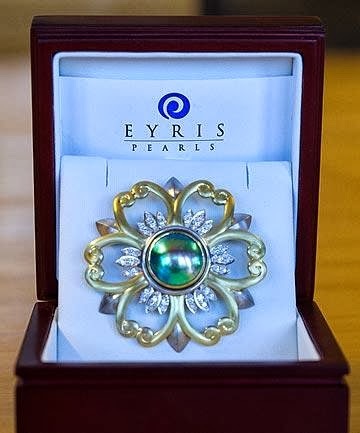 Monarchy New Zealand shared via Twitter a personal gift given by New Zealand Prime Minister John Key to the Queen during his September 2013 visit to Balmoral Castle: a brooch! 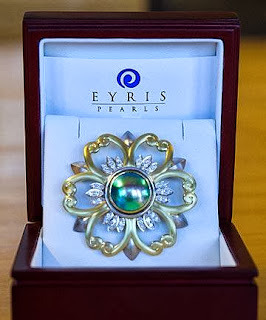 From Eyris Pearls in Christchurch, the brooch includes a blue pearl surrounded by a design of mixed metal tones and what look to be marquise diamonds. The blue pearl makes an interesting addition to the brooch collection; I don't know that I've seen the Queen wear a blue pearl before, publicly at least. She already has at least one New Zealand-specific brooch, of course, the New Zealand Fern Brooch.